1917 - Johnny Thunder is born the seventh son of a seventh son. 1924 - 7-year-old Johnny is kidnapped by the badlandian cult who bond him with the fifth-dimensional entity Yz. 1934 - 17-year-old Johnny discovers Yz, the source of his incredible luck. 1941 - After the attack on Pearl Harbor, The Justice Society is formed, including 24-year-old Johnny. 1951 - The Justice Society is trapped in Ragnarok, including 34-year-old Johnny, who dies trying to escape. If Johnny Thunder wasn't a long-time member of the Justice Society, he would likely have been forgotten. He's an archetypeal character that pervaded comics for decades, a smart-talking everyman in a bowtie meant to represent the reader, often as a sort of mascot. You saw it constantly in characters like Johnny, Jimmy Olsen, Snapper Carr... it happened over and over until the Incredible Hulk's Rick Jones revitalized the archetype by being a hippie. There have been attempts to make a modern version of Johhny Thunder, primarily by passing on the Yz the Thunderbolt to a new character named Jakeem, a streetwise, foul-mouthed teenager. 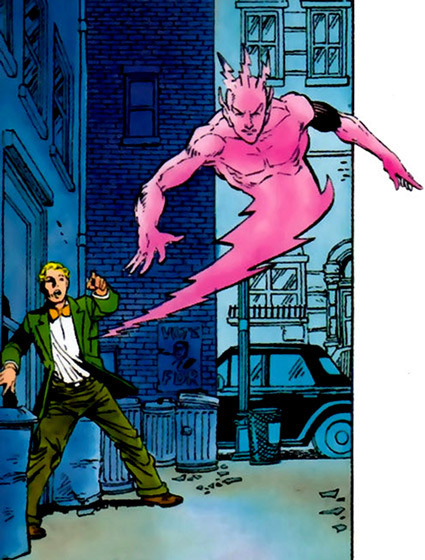 The concept gets an A for effort, but honestly, the world didn't need Jakeem Thunder any more than it needed Johnny Thunderbolt, a character made by merging an aging Johnny Thunder WITH the Thunderbolt. Ultimately, they were all simply trying too hard. Johnny Thunder is a part of the vintage Justice Society, and that's just fine.